A smart, amusing, empathetic look at motherhood from the team behind Young Adult and Juno. When writer Diablo Cody, filmmaker Jason Reitman and actor Charlize Theron first teamed up for 2011's Young Adult, it really couldn't have worked out better. Charting the exploits of a thirty-something ex-prom queen returning to her home town, their acerbic and amusing movie served up a perceptive portrait of arrested development. Joining forces again for Tully, the trio have another aspect of adulthood in their sights, this time exploring the ups and downs of motherhood. It's not Cody and Reitman's first stab at the subject, given that the pair initially worked together on teen pregnancy comedy Juno. But if they'd like to keep pumping out films about different life stages every couple of years, please, no one stop them. In Tully, Marlo (Theron) is a mum of two who's days away from giving birth to her third child. Unsurprisingly, she's already utterly exhausted. When her new bundle of joy arrives, she's even more stressed and tired, with her husband (Ron Livingston) hardly a hands-on dad. Enter a gift from her well-off brother (Mark Duplass), albeit one she's reluctant to accept at first. He's adamant that a night nanny will change her life, and when serene and soothing twenty-something Tully (Mackenzie Davis) arrives on her doorstep, Marlo soon discovers that he's right. Tully doesn't just take care of the baby each evening so that Marlo can sleep. From cleaning the house and cooking cupcakes for the kids to providing much-needed pep talks and sharing sangrias, Tully takes care of Marlo too. The scenario inspires rich performances from a particularly raw Theron and a suitably sparkling Davis — the former committed to conveying the hardships of maternity in all of its unglamorous glory, the latter calm and kind as Tully brings Marlo back from the brink of desperation. The pair complement each other perfectly, while fleshing out their characters with the type of detail that can only be drawn from reality. As Theron switches from weary to anxious to utterly fed up, the star couldn't offer up a more relatable picture of parenthood. As Davis embodies the caring yet carefree figure every woman has wished she could be, she helps show why such fantasies are ultimately just that. Indeed, while the film couldn't feel more authentic than when Theron is in unhappy wife and mum mode, it kicks into another gear when its two leads share the screen. Cody's script segues from relaying honest truths about being a mother to exploring the importance of female connections, and neither element should be underestimated. 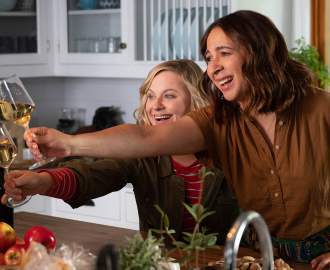 Few flicks lay bare the struggles of postnatal depression in such frank but funny terms, and even fewer present complicated, unconventional but unconditionally supportive bonds between women. The writer's usual cynicism is ever-present, recognisable to anyone who's seen the screenwriter's previous films; however if she actively set out to refute every mainstream depiction of idealised mums and stock-standard gal pals, she's nailed it. That said, Tully is likely to divide audiences, all thanks to one decision that this review won't spoil. A bold choice that initially seems like Cody and Reitman might be taking the easy way out, it's actually one of the movie's most astute moves, as well as a development that the director's naturalistic, roaming visual approach subtly builds up to. Tully shows that mums don't stop being people when they usher new life into the world. It firmly demonstrates that everyone needs support. It warmly depicts women looking after each other. More than all of that — and most importantly — the film probes society's willingness to believe that mothers can do it all, often single-handedly. Admitting how ridiculous that expectation is would upset the long-held status quo, but this movie happily takes aim at the idea in a smart, savage and still empathetic fashion. It shouldn't come as a surprise that Cody wrote the script after having her own third child, or that this excellent ode to self-care ranks among her finest, most mature pieces of work.